Heat the oil in a medium saucepan or casserole, over medium-high heat until hot but not smoking. Add the drained rice and cook, stirring often, until the rice becomes milky white and feels heavy in the pan as you stir, about 3 to 4 minutes. Add the scallions and stir and cook until softened, 2 to 3 more minutes. Add the chicken broth, orange blossom water or orange peel, salt and stir. When the mixture starts to boil, cover the pot, reduce the heat to lowest setting and cook until the rice is cooked through and the liquid has been absorbed, about 20 minutes. If the rice grains don't seem soft and cooked through, add a bit more chicken stock or water and let it cook for another 5 more minutes or so. Remove the pan from the heat and let it sit covered for 5 to 10 minutes. Fluff with a fork and set aside. 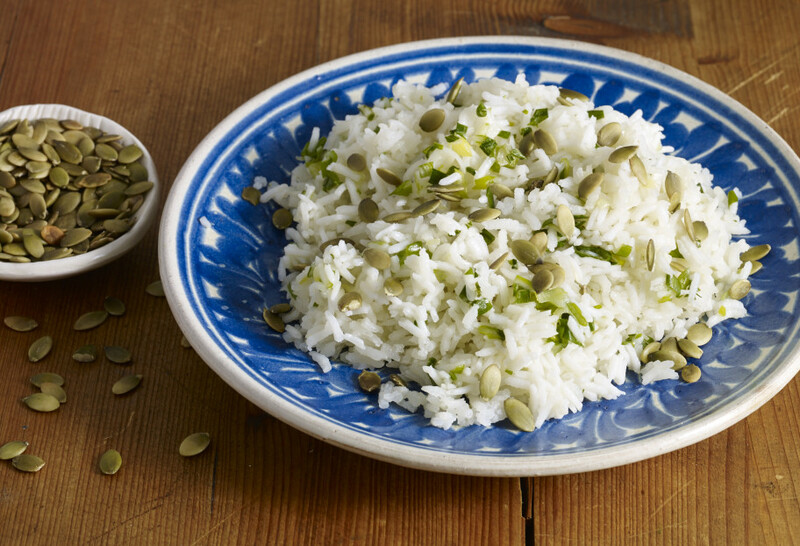 Serve and decorate with the lightly toasted pumpkin seeds. Beautiful rice, I’m making some tonight! Thanks for your wonderful recipes!! Lovely idea, I’m making it today! Looks yummy and can’t wait to try…. Out of curiosity, where would you get orange blossom water? Try a speciality food market or online. I like all the recipes in your show.